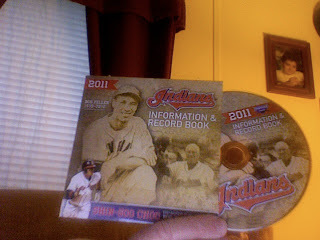 Thanks to Mark, who never ceases to amaze me with the Indians-related doo-dads he finds, sent me a link to the 2011 Indians Media Guide on CD. Of course, I bought it right away. I had no idea what the CD would hold, so when it arrived the other day, I slipped the disc out of the sleeve and into the drive. The disc contains one file. Really? A whole CD for one PDF? Wow. Well, the media guide contains 478 pages, and lots of full-color photos. The document itself has player information, Indians historical info, and more. There is a "history of Progressive Field," which only mentions the name "Jacobs Field" once, and that is just when the stadium changed its name TO Progressive. So, anything related to the stadium BEFORE the insurance company bought the naming rights is still referred to as "Progressive." I find that absolutely tasteless. There is a nice tribute to Bob Feller and an extensive list of records, history, prospects, and current players (as of 2011, anyway). I enjoyed the "History of Indians Names," which explains how the Tribe got their name and the heritage and tribute the "Indians" name means to the Native Americans for which the team honors. I know this is a very sticky situation for some people, but the descendants of the Penotscot tribe have given their blessing on the team's name. I know the Tribe has been slowly moving away from using the name more and more over years, but I think it is a great way to honor one of the greatest Native American players (and all of them as well) to keep the name. I'm not real sure what I'm going to do with it yet, I mean in addition to adding it to the Tribecards collection. But, it does make for a unique member of the Tribecards family. Thanks, Mark, for helping spend my collection money! I just finished reading "Indian Summer" by Brian McDonald. "The forgotton story of Louis Sockalexis,the first Native American in Major League Baseball". What a great read ! I have that media guide but what's the link to that cd? David - you're more than welcome.